Factory assembled composite panels for residential, educational, religious and many types of commercial structures. 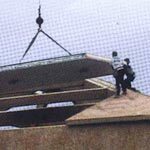 Nail Base, Stress Skin or Structural Panels are provided with an OSB top facer which allows shingles, shakes, metal, an adhered membranes or other roofing materials to be attached. The underside facer meets decorative, structural and/or fire resistance specifications. PaceMaker produces the UL listed expanded polystyrene (EPS) cores which provide stable, high R-value insulation for the roof. Wire chases within the cores and various edge treatments are available as specified. Oriented Strand Boards, EPS cores, gypsum, T1-11 and T & G planking are standard construction materials combined into composite panels. Thousands of projects built with these materials have performed well for many years. Structural Insulated Panels (SIPs) may reduce roof framing members. The EPS insulation core and fewer joints reduce energy costs. Panels can be installed faster. PaceMaker has experience in supplying composite panels for thousands of projects since 1975. Underwriters Lab (UL) and PFS/TECO quality control procedures cover all components and manufacturing operations. In-process inspection assures tight tolerances and adherence to specifications. Experienced estimators process accurate quotations promptly... and at no charge. Skilled employees with proprietary equipment produce panels to meet your construction schedule in our 125,000 square feet of production space. Stable, high R-Value EPS cores (with no CFCs) save energy and reduce pollution. OSB wood facers are regenerable. PaceMaker can provide adhesive/sealant, proper screws to penetrate wood or steel structurals, wood I-joists and various types of splines. For design assistance, load charts, construction details, code listings or further information contact us.